Here’s a list of the problems i experienced in the process. Some of the first problems i saw with the RC went away after I did ‘windows update’ so make sure you run the patches. Cant customize instances of File Explorer like XP could. Single instances of File Explorer used to remember their settings. Now it seems the settings just revert to the last usage. For instance if you resize the file explorer window or decide to view a particular folder as icons instead of details, etc. Once the File Explorer turns off the folder view (Navigation pane), I had a lot of trouble figuring out how to turn it back on again. Hello microsoft ! properties for an app should be controlled from within the app !! Maybe the ‘View’ menu would be a good place for this option. Its ‘hidden’ in a menu you can only get to via icons. Some old installer files become mysteriously locked and unusable. I overwrote my machine with W7 from XP. I have a habit of placing any new programs i install in a folder called ‘installs’. Just in case i need to reinstall them. Some of these files now give me the mysterious message ‘Windows cannot access the specific device, path, or file. You may not have the appropriate permissions to access the item ‘. (I have admin rights, so this should not be true) I can download them again from there original source and they seem fine. It is not obvious why i cant use the existing files. The ‘Toubleshoot compatibility’ option seems like it would be promising but ultimately does nothing. Pressing the ‘Start the Program…’ button makes the app just blink at me. I finally discovered that the issue was security right assigned to files. Not obvious. Just assign full permissions for that file to the ‘Users’ user group and the problem goes away. No support for displaying 32×32 icons which most older apps prefer. So almost all apps look weird with stretched icons. Visual Studio 2005 looks weird. Simple drag and drop doesnt work if the app is running as administrator. I used to be able to drag files from file explorer over to Visual Studio 2005. That doesnt work in W7. Windows Search got introduced in XP. It is wonderfully useless. Most of the time i just want to find a file by its name.� This feature seems to have been removed in W7. Remember the old fashioned ‘find a file by name ‘ in File Explorer with the irritating dog mascot? Both seem to be gone. The UAC (User Access Control) warning messages when starting applications is every bit is annoying and useless as the Apple commercials describe for Vista. Microsoft still has not figured out how to make these less annoying. 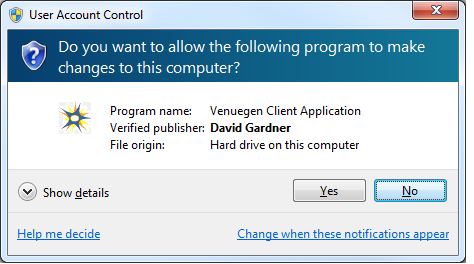 I have read there is a well hidden option to turn off UAC for trusted applications but I have yet to find it. Ideally it would be a button on the warning popup dialog, saying something like “always trust this app” but that would be way too easy. At least maybe for signed apps ? OK Here’s one i really hate. Microsoft has created in Vista the notion of ‘Junctions’. It remaps directories to other directories. This is similar to the Linux concept of symbolic links, which is fine. The Windows File Explorer just gives the error ‘Access Denied’ when you try to open them. They are sometimes drawn as slightly grayed or have a tiny link arrow square on the icon to show they are different from normal directories. (ex. ‘Documents and Settings’) This would lead one to believe that it’s a security problem, which it is not. There is no good way to figure out where these junctions go from WFE. Right click and bringing up the properties dialog does not show any useful information. Still looking into this. Its hard to not prejudice myself against W7 just because i’m not used to it. Ultimately I think Microsoft needs to find themselves some fresh focus groups to point out the blatantly obvious non intuitive user interface issues. Maybe Microsoft has become so insular they dont ask opinions from people who aren’t microsoft employees ? On the flip side it really has some things that have been smoothed out from previous versions of Windows. When a file is in use by another app and i cant delete it, W7 now tells you what file has it locked. That has always been a big pet peeve of mine from XP. I’m going to keep using W7. Some of the issues really are just a matter of getting used to it. Speed wise I’d say its about even with XP. Much prettier ‘Aero’ glassy look. For any who wonder if they should upgrade. I’m not seeing a huge compelling reason to do so, unless you are like me and need to debug apps that have Vista/W7 specific issues. I suspect cost might be a big issue for people. The trial of RC1 is so far free. Vista was WAY too expensive. It was much more than XP. It is rumored that W7 will be even more expensive and come in more pointlessly confusing varieties. We’ll see. The Apple commercials do a pretty good job of describing how ridiculous this is.